The Masterchuck is no longer manufactured but is available second hand. It provides a reliable strong chuck. Make your own wooden jaws. Four steel self centering jaws which grip both internally (expand into 70mm recess) and externally (compress onto 38mm "spigot"). Jaw movement is 7mm change in diameter. Jaws provided with fixing holes for attaching steel extension jaws or home-made wooden jaws of various sizes and shapes. The chuck is opened and closed by rotating the outer ring with the aid of a tommy bar. For safety, the outer ring of the chuck is smooth with no T slots or projecting jaw sliders. 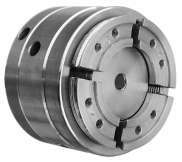 The outer ring is 80mm diameter giving a very compact chuck. Locking ring, also 80mm diameter, is provided to lock the chuck solid and eliminate vibration in use. Easily changed threaded inserts enable the chuck to fit almost any lathe thread up to 1,1/2" diameter. Extensive 32 page instruction manual and quality tool set provided. The Masterchuck offers a dependable versatile chuck at reasonable cost. It has just as good a grip as the more expensive scroll chucks and will do the same job. In some ways it is more versatile as it has the unique ability to freeze the jaws solid to facilitate making your own home-made wooden chuck jaws any size you like at little cost. The jaw movement is only 1/4" so you have to be careful to turn the workpiece to fit the jaws, but this process is easy with the aid of a simple gauge. The chuck is easy to use and, if you ever have to take it apart to clean it (some users never do this!) you will find that there are no fiddly springs or small parts to frustrate you and definitely no rubber bands. They grip internally into a 1,1/2" dovetail recess or extenally onto a 7/8" spigot. It grips into a 1" dovetail recess or externally onto a 3/8" spigot for tiny projects. This set of steel quadrants bolts onto the jaws of the chuck and provides secure mounting for home-made wood jaws. Just mount the roughly shaped wood pieces with wood screws, fit to the chuck, lock the jaws solid and turn the wood jaws to shape. They will run true if turned on the chuck. The bottom picture shows a typical set made to reverse-grip a bowl or platter for cleaning up the other side or the bowl base. 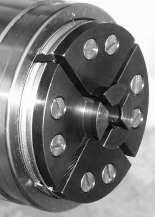 See our Thread list to see if the chuck can fit your lathe. Chuck comes with internal and external jaws, locking ring, toolset and 32 page instruction manual.